Here's the ultimate telephone conversation recording device. Set up is simple: Plug this little wonder into a wall jack, pick the recording quality mode that suits the situation, then with one simple button press your conversation is being recorded. The unit will record both outgoing and incoming conversations - while you listen with the included ear buds, if you wish. Powers down after four hours of use, helping to save the batteries. Its MP3 and WMA recordings transfer easily to your PC via the built in USB port. 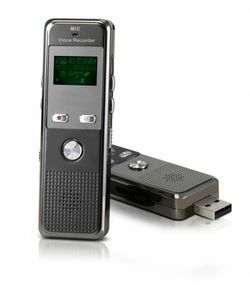 This new model also features a built in FM radio, retractable USB port, and is much more durable than some other models of voice recorder thanks to its metallic molding.